Jessica Grater focuses her practice on Estate Planning, Estate Administration, Social Security Disability, and Litigation. Born in Pottstown and raised in Bechtelsville, Jessica has very strong local ties. 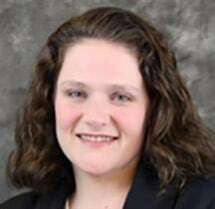 She graduated from Boyertown Area Senior High School in 1993, and went on to earn her Bachelor's degree from the University of Pittsburgh, graduating magna cume laude. In 2007, she earned her Juris Doctor degree from Widener University School of Law, where she graduated in the top one-third of her class and earned a Certificate of Achievement in Constitutional Law-Seminar. During her college and law school careers, she acquired several years of legal experience working as a legal intern at the ACLU, Greater Pittsburgh Chapter; a legal assistant for an immigration and nationality firm in Philadelphia; a paralegal for medical malpractice defense firms in Allentown and Harrisburg; and as a law clerk for a general practice firm in Wyomissing, where she continued to work as an associate attorney after passing the Bar Exam. Prior to joining Wolf, Baldwin & Associates, P.C., Jessica worked as a General Practitioner in Boyertown and is excited for the opportunity to be able to continue to serve her hometown community. Jessica strives to give her clients a high level of personal service and is very community-oriented. She is currently the President-elect of the Boyertown Rotary Club; is a Past President of the Boyertown Rotary Club; is a member of the Boyertown Area Charitable Program Advisory Committee; and was involved in the installation of the Fenstermacher Walking Trail located at the Boyertown Park, which was featured by the Tri County Chamber of Commerce during their annual Progress Dinner. In addition to her work with the Rotary Club, she participates in the Boyertown Relay for Life.